As the Obama administration tries to convince skeptics in Congress on both sides of the aisle to authorize the recent agreement brokered with Iran last month to limit the country's ability to develop a nuclear weapon, nearly half of Americans say they don't know enough about the deal to have an opinion. But among those with an opinion, more disapprove (33 percent) of the agreement than approve (20 percent) of it. Republicans are particularly critical; 58 percent disapprove. Flash Points: What are Congress' key questions about the Iran deal? More than half of Americans think a deal more favorable to the U.S. could have been negotiated, including 71 percent of Republicans. Democrats are divided: 41 percent think a better deal could have been reached, and 38 percent think the U.S. reached the best deal possible. There is skepticism about how effective such a deal will be in curtailing Iran's nuclear ambitions. 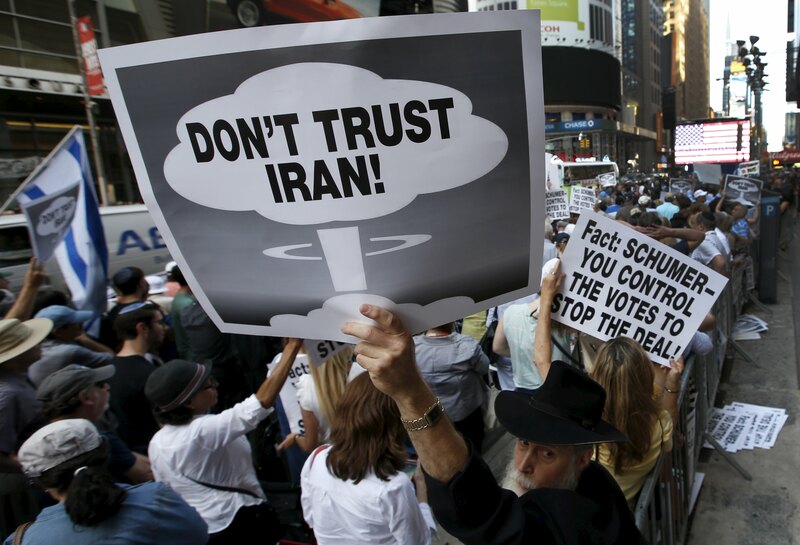 Fifty-three percent of Americans say the agreement will be not very or not all effective in preventing Iran from developing a nuclear weapon, including more than three in four Republicans and half of independents. Most Democrats are optimistic that the deal will be at least somewhat effective. Americans continue to think the U.S. fight against ISIS is going badly - more than six in 10 say it is, including 28 percent who say it is going very badly. Just 28 percent think the fight against ISIS is going well. But the public remains divided on the use of U.S. ground troops to fight ISIS militants in Iraq and Syria. While 46 percent favor the use of ground troops, 45 percent oppose. Most Republicans (60 percent) favor the use of American ground troops and most Democrats (55 percent) are opposed. Independents are divided. In the CBS News Poll's first measure of attitudes toward gun laws since the deadly shootings in Charleston, South Carolina, Chattanooga, Tennessee and Lafayette, Louisiana, Americans' views are largely unchanged since last year. Fifty-two percent want stricter gun laws, 13 percent want gun laws that are less strict, while about a third thinks they should be kept as is. These percentages have changed little over the past two years. There continues to be a partisan divide on this issue. Most Democrats favor stricter gun laws, while most Republicans do not. A slim majority of Americans think stricter gun laws would help at least somewhat to reduce gun violence, but 47 percent don't think stricter gun laws would help much, if at all. Democrats are the most optimistic that stricter gun laws would help, while Republicans are the most skeptical. But there is overwhelming support for a federal law requiring background checks on all potential gun buyers. Eighty-eight percent of Americans favor such a law, including large majorities of Republicans (81 percent), Democrats (93 percent), and independents (89 percent). The economy remains the issue volunteered most often as the most important problem facing the country today, and views on the condition of the economy are mixed. Forty-eight percent of Americans think the economy is at least fairly good, while 51 percent characterize it as bad. Slightly more Americans think the economy is getting better (28 percent) than getting worse (25 percent), though nearly half - 45 percent - think the economy is staying about the same. Sixty-three percent of Americans - including 60 percent of independents and nearly nine in 10 Democrats - think money and wealth in this country should be more evenly distributed among more people, while 30 percent feel that the distribution of money and wealth in the U.S. is fair. About half of Republicans (51 percent) think it is distributed fairly. More Americans disapprove than approve of how President Obama is handling Iran, ISIS, terrorism, and the economy. Forty-four percent of Americans approve of President Obama's handling of the economy, and 42 percent approve of his handling of the threat of terrorism. Even fewer - 37 percent - approve of President Obama's handling of Iran, and just 34 percent of Americans approve of President Obama's handling of the situation with ISIS militants in Iran and Syria. President Obama's overall approval rating remains divided: 44 percent of Americans approve of the job he is doing as President and slightly more - 47 percent - disapprove. Mr. Obama's approval rating has been divided and largely unchanged since January. And while most Americans (55 percent) think Barack Obama has strong qualities of leadership, most also (53 percent) think he does not have the same priorities for the country as they do. Meanwhile, the public continues to give Congress decidedly negative ratings. Only 17 percent of Americans approve of the job Congress is doing, while three in four disapprove. This poll was conducted by telephone July 29-August 2, 2015 among a random sample of 1,252 adults nationwide, including 1047 registered voters. Data collection was conducted on behalf of CBS News by SSRS of Media, PA. Phone numbers were dialed from samples of both standard land-line and cell phones. The error due to sampling for results based on the entire sample could be plus or minus three percentage points. The error for subgroups may be higher. Interviews were conducted in English and Spanish. This poll release conforms to the Standards of Disclosure of the National Council on Public Polls.